And how that poses a radical challenge to both climate deniers and mainstream liberals. It must be a little disorienting, as a Democrat heading into primary season, to wake up one morning and find yourself to the right of the pope. And not just any pope, but a wildly popular rock-star pope, whose favorables even among non-Catholics are sky-high. Yet that is the situation in which most Democrats, and certainly presidential front-runner Hillary Clinton, find themselves on the question of climate change as Francis comes to the United States in September to address Congress and the United Nations. Since June, when the pope released Laudato si’ (Praise Be to You), his epic encyclical on ecology, climate, and economic justice (its title taken from a canticle of St. Francis of Assisi), media coverage has focused obsessively on what it all means for climate-science-denying Republicans. Alas, this sets the bar a bit low—and lets liberals and lefties off the hook. Because equally important is the challenge that the pope’s message presents to those who purport to take climate change and its threat to humanity, especially the poor and the young, at all seriously. It’s fair to say that Democrats at the national level, and many others up and down the left side of the spectrum, have yet to fully embrace the urgency of climate justice as an organizing principle—perhaps the organizing principle—of our politics and, indeed, our society. And make no mistake: Francis, as he brings a message merging ecology and liberation theology, is the climate-justice pope. It’s important, of course, for those who care about the climate not to romanticize this moment, or this pope. 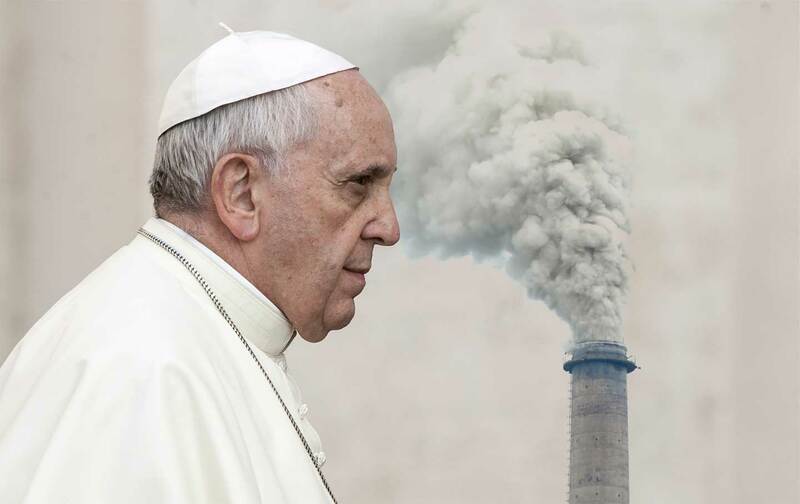 Francis is not our climate savior. (Nobody is.) He does not walk on water. However sincere and compassionate he may be (and he appears to be both), in his role as the pope he’s a politician, a world leader at the head of a rich, powerfully influential, and entirely human—that is, deeply fallible—global institution. And he presides over a conservative theological tradition whose teachings on gender, sexuality, marriage, contraception, and abortion are, to many of us, and women in particular, not only wrong but oppressive. For these and other reasons, his ability to single-handedly reshape climate politics, especially in this country, is limited, to say the least. What’s more, the substance of his encyclical offers nothing particularly new. Francis is hardly the first religious leader, or even the first pope, to frame ecology and climate in moral and theological terms—a view widely accepted among the world’s religions—or to make the case for climate justice. To be honest, when I learned that Francis would issue an “unprecedented” papal encyclical linking climate and poverty, my first reaction was something like “Wonderful! It’s about time.” Yes, his predecessors John Paul II and Benedict XVI (called by some the “green pope”) said some good things about protecting creation and the poor, and the inseparability of the two, and the Vatican has long been on the side of climate science. But it seems fair to ask why it’s taken so long for the Roman Catholic Church to step up in such a strong way. It’s 2015, not 1995 or 2005. The pope’s engagement is certainly a welcome boost in advance of the crucial UN conference in Paris this December—and, who knows, may yet help to change the game in Paris and beyond. But in truth, this is long overdue. Late in the fourth quarter, the clock running down, it looks a lot like a Hail Mary. Nevertheless, what is surprising and undeniably significant about Francis’s message is the forceful way he foregrounds a radical systemic analysis of the deep structural causes of the climate and ecological crisis, the kind of radical response required, and the political and economic forces standing in the way. In the process, he echoes what climate-justice advocates have been saying for decades. In fact, perhaps most remarkable is the way Francis has made this bracing argument for climate justice, with an explicit “preferential option for the poor”—the essence of a once-suspect and marginalized liberation theology—central to his papacy, indeed to the very mission of the church in the 21st century. No doubt many mainstream American Catholics, especially those attempting to occupy an increasingly untenable middle ground, don’t know quite what to do with this pope’s radicalism. In the run-up to the encyclical’s release—a many-months-long, carefully choreographed PR rollout unlike anything Vatican observers could recall—there was a tendency among centrist and liberal commentators to downplay its politics, as if any acknowledgment that the pope has an ideology as well as a theology would somehow discredit or demean him. “The encyclical will not be primarily a political call for action…. It will be a theological meditation,” wrote The Boston Globe’s John Allen Jr., a knowledgeable and respected Vatican watcher, in the weeks before publication, as he set about debunking the “myth” that Francis is a leftist. “He’s not Che Guevara in a cassock,” quipped Allen. While it’s true that Pope Francis is no Marxist- Leninist guerrilla leader seeking violent revolution, it is also the case that he has embraced liberation theology, and its deep critique of structural economic injustice and oppression, with open arms. This is the same pope who wrote, in his first apostolic exhortation, Evangelii gaudium (The Joy of the Gospel): “Today we also have to say ‘Thou shalt not’ to an economy of exclusion and inequality. Such an economy kills.” Yes, this summer’s encyclical is first a theological and moral document—but it is also, inescapably, a deeply political one. Intriguingly, in an act much less publicized than the invitation to Gutiérrez, Francis also reached out early on in his papacy (as reported by his biographer, Paul Vallely) to a far more controversial figure: the Brazilian theologian and former Franciscan friar Leonardo Boff, another of the founders of liberation theology, who in 1985 was silenced by Ratzinger for his criticism of the church and subsequently left the priesthood. Boff is also known for his work on ecotheology; according to Vallely, this was among the reasons that Francis reached out to him privately and asked Boff to send his writings, saying he wanted to publish an encyclical on environmental issues. Boff’s best-known work in this vein, an effort to unite ecology and liberation theology, is his 1995 volume Cry of the Earth, Cry of the Poor. Many have pointed to the primary role of Cardinal Peter Turkson of Ghana, who heads the Pontifical Council for Justice and Peace, in drafting Laudato si’. Turkson’s speeches, including his Trócaire lecture last March in Maynooth, Ireland, previewed several of the central themes, in particular the idea of an “integral ecology” linking “concern for the poor and for creation.” And yet the parallels between the encyclical’s social critique and Boff’s radical analysis—especially his call, in Cry of the Earth, Cry of the Poor, for an “integral liberation, of the human being and of the Earth”—are equally striking. Although Boff and his work are nowhere acknowledged in the encyclical’s text or footnotes, his presence seems to hover like a ghost. It should be no surprise that Francis, the first Latin American pope and the first from the Global South, where the Catholic Church’s center of gravity now lies, is the climate-justice pope, squarely on the side of the poor and the developing world—a region in which the concept of climate justice, far from being some marginal left-wing cause, is the mainstream majority view. In the encyclical, Francis frames the unfolding climate catastrophe as a fundamental issue of human rights and social justice for the global poor—as well as for today’s young people and future generations everywhere—because they bear little or no responsibility for causing the crisis and yet will suffer, and in many places already are suffering, the worst consequences. It follows, then, that wealthy developed nations—whose prosperity is the result of having already consumed, over the past 200 years, most of the carbon that scientists tell us can ever be burned if humanity is to have a decent shot at a livable climate within this century—should bear the lion’s share of the burden, paying a sort of “climate debt” to the rest of the world, on whose backs they became rich. This means not only slashing greenhouse-gas emissions at a pace and depth far beyond anything we’re seeing now, but just as important, providing financial and technical assistance so that developing nations—whose emissions, largely from coal, will otherwise grow disastrously—can make the necessary transition to renewable energy and a new model of sustainable development. The same principle of a “just transition” applies to poor and marginalized communities, most often communities of color, within our own country; climate justice is scalable, from global to local. That accountability—or, really, the all but universal failure to acknowledge and act upon it—elicits some of Francis’s most forceful language. In a much-cited passage, read as a rebuke to climate-change denialists and their backers, he lowers the boom on the wealthy and powerful who obfuscate, obstruct, and delay: “Many of those who possess more resources and economic or political power seem mostly to be concerned with masking the problems or concealing their symptoms, simply making efforts to reduce some of the negative impacts of climate change.” Instead, he writes, “there is an urgent need to develop policies so that, in the next few years, the emission of carbon dioxide and other highly polluting gases can be drastically reduced, for example, substituting for fossil fuels and developing sources of renewable energy.” Some countries have made real progress, he notes, but it is nowhere near enough. This is a stark and accurate assessment, in line with what the world’s climate and energy experts, from the United Nations to the International Energy Agency and the World Bank, have been saying for years. And it should be obvious that conservatives are not the only ones failing—theirs is just the most egregious failure. Continuing in this vein, the pope goes on to endorse the notion of a carbon budget. After pumping greenhouse gases into the atmosphere for two centuries, rich countries have used more than their share of “environmental space,” Francis explains, with “repercussions on the poorest parts of the world.” As a result, “the developed countries ought to help pay this debt by significantly limiting their consumption of non-renewable energy and by assisting poorer countries to support policies and programmes of sustainable development.” Name the last time we heard a Democratic candidate make the case for paying our massive “ecological debt”—our climate debt—to the developing world, as part of a foreign policy aimed at preserving any hope of global stability in coming decades. There’s far more to this encyclical than the sort of wonkish passages quoted here. It’s a rich theological text, often lyrical, grounded in Scripture and church teaching, as well as in a deeply spiritual regard—owing much to the pope’s namesake—for an ecological understanding of humanity’s place in creation. It also contains a sharp critique of the modern “technocratic paradigm” and cult of infinite growth that have given rise to runaway consumerism and a “throwaway culture,” breeding a “globalization of indifference” to the sufferings of others. Mainstream liberals need to confront the imperatives of global equity that lie at the core of climate justice. This is due partly to the fact that many professionals, opinion makers, communications media and centres of power, being located in affluent urban areas, are far removed from the poor, with little direct contact with their problems…. This lack of physical contact and encounter, encouraged by the disintegration of our cities, can lead to a numbing of conscience and to tendentious analyses which neglect parts of reality. At times this attitude exists side by side with a ‘green’ rhetoric. The emphasis is the pope’s. Somewhere, Leonardo Boff is smiling. Not that there’s much to smile about. In the summer of 2012, some 80 percent of the so-called permanent Arctic sea ice was gone, melted. Scientists say it’s hard to imagine the ice ever re-forming within any timescale that matters to human civilization. And, as they point out, the stability of the global climate system depends on the Arctic. Meanwhile, the world’s known fossil-fuel reserves contain as much as five times the carbon that science tells us can ever be sanely burned if we want a planet hospitable to humans. And yet the fossil-fuel industry and its political enablers have doubled down on a profit model that involves extracting and selling it all. Indeed, hundreds of billions of dollars are still spent each year exploring and drilling for more—including now, thanks to Barack Obama, in that newly melted Arctic. As the world heads toward Paris, climate experts debate whether the 2°C goal—keeping the global average temperature from rising more than two degrees Celsius (3.6°F) above the preindustrial average, beyond which all bets for human civilization are off—has forever slipped away. (In truth, as former top NASA climatologist James Hansen and his coauthors argue in a study published this summer, all bets may already be off, even though we’ve raised the global average temperature by only about 1°C. Witness the rapidly melting Arctic and Antarctic glaciers—with perhaps 10 more feet of sea-level rise possible this century.) We’re told the 2°C goal is still technically achievable, but only with drastic, immediate, and coordinated action by all countries. Of course, nothing close to what’s required will be on the table in Paris—but that’s OK, we’re told, because Paris is merely part of an “ongoing process.” And so we plunge toward the worst-case scenarios, within the lifetimes of today’s children. All the while, American politics proceeds as though this situation were somehow tolerable. Or as though this existential threat—with billions of lives and incalculable human suffering at stake—can somehow be met by business and politics as usual. How does Hillary Clinton propose to close the gap between the politically “possible” (i.e., expedient) and the scientifically necessary? What we’ve seen thus far of her climate plan—like her proposal to power every home in America with renewables by 2027—is welcome, but still lacks the kind of ambition required. And if she believes the gap can’t be closed—if, in effect, she is privately resigned to what’s coming—then what does she tell her grandchild? What does she tell the women and children of the developing world, about whom she cares so much? Challenging US politicians: Francis’s message is an implicit rebuke to Obama’s “all of the above” energy strategy. Would Hillary Clinton reverse it? How will Clinton close this gap? Would she approve the Keystone XL pipeline, accelerating the ecologically and culturally devastating extraction of the Alberta tar sands, one of the largest carbon deposits on Earth—as she said, in 2010, her State Department would be “inclined” to do, even before the environmental review? Would she hire more oil lobbyists? Would she continue to promote methane-leaking fracked gas? She has broken with Obama over Arctic drilling—a positive sign—but will she keep Powder River Basin coal, with enough carbon to make a joke of Obama’s Clean Power Plan, flowing to Asia? Or will she step up and make climate justice— including doing everything conceivable to keep carbon in the ground—the overriding civilizational priority that Pope Francis argues it must be? In effect, Francis has called Hillary’s (and the rest of the mainstream Democrats’) bluff. While Democrats, and others on the left, continue to pat themselves on the back for not being climate-change deniers, they avoid the radical implications of what the science is telling us—including the need to rethink capitalism and redefine economic growth (see, for example, the Next System Project spearheaded by Gar Alperovitz and Gus Speth). But Francis is saying to them: If you’re serious about economic and social justice, as you claim to be, then you need to be serious about our impending climate catastrophe. And to be serious about these things, at this late date, means being as radical as he is. Because the time for anything less has long since passed. The earth and the poor are crying out. Do you really hear them, Francis wants to know, or are you just pretending?